This fascinating tour will introduce you to mysterious pre-historic sites, the stunning cliffs of the northern coast including a stroll along the cliff top path at Duncansby Head. This fascinating tour introduces you to the rugged beauty of Caithness, striking northern coast cliffs, and the chance to spot some local wildlife. Caithness, striking northern coast cliffs, and the chance to spot some local wildlife. Departing Inverness to head across the Black Isle to the Cromarty Firth. A 27m (90’) statue of the first Duke of Sutherland towers above the town of Golspie. The duke’s agents were involved in the most notorious of the Highland Clearances in the 19th century. You’ll learn more about this period of Scotland’s history later in the tour. We soon arrive in Caithness, a remote county whose traditional industry was herring fishing. Many harbours were constructed here during the 19th century to meet the increasing demands of this ever-expanding industry. We will make a stop at one of these charming harbours for a quayside picnic lunch (weather permitting). 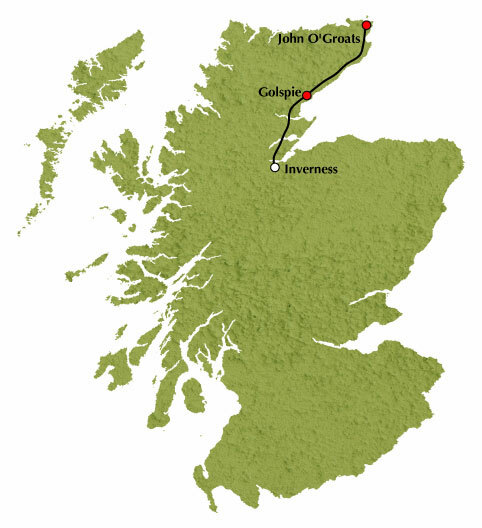 We will also stop in John O’Groats for that "I was there” photograph at the very tip of the British mainland. We then make our way to stunning Duncansby Head, for a stroll along the cliff-top path, rewarded with views of sea stacks and coastal views. Duncansby is renowned for its birdlife including guillemots, kittiwakes and, its most famous residents, puffins (until late July). From Duncansby, we turn southwards through Wick, where there will be a comfort stop, to reach journey’s end in Inverness. Tour Highlights: The Black Isle, nature-watching, Golspie, pre-historic sites, John O’Groats, Duncansby Head and Wick. The name of the local tour operator and full departure information will appear on your tour voucher/confirmation.